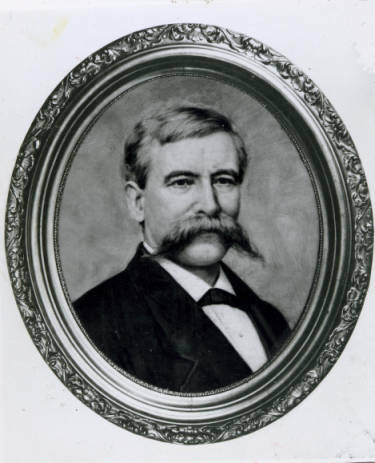 Photograph of a portrait of Thomas L. Young (1832-1888) of Cincinnati, Ohio. He served as governor of Ohio from 1877-1878. In July 1877, a national railroad strike spread to the state of Ohio. Young addressed the strike in Ohio by using the state militia. After a few weeks, the strike was settled, and the militia troops returned home. Young restored order in Ohio, but he was unable to address many of the issues that had caused the strike. After leaving the governorship, Young was elected to the United States House of Representatives for two terms and served from 1879 to 1883. The Great Railroad Strike of 1877 began on July 17, 1877, in Martinsburg, West Virginia. Workers for the Baltimore & Ohio Railroad went on strike, because the company had reduced workers' wages twice over the previous year. The strikers refused to let the trains run until the most recent pay cut was returned to the employees. West Virginia's governor quickly called out the state's militia. Militia members, for the most part, sympathized with the workers and refused to intervene, prompting the governor to request federal government assistance. President Rutherford B. Hayes sent federal troops to several locations to reopen the railroads. In the meantime, the strike had spread to several other states, including Maryland, where violence erupted in Baltimore between the strikers and that state's militia. In Pittsburgh, Pennsylvania, and St. Louis, Missouri, strikers temporarily gained control of the cities until federal soldiers reestablished order. In Chicago, Illinois, more than twenty-thousand people rallied in support of the strikers. The strike also affected Ohioans. Governor Thomas Young encouraged Ohioans to form private police forces to defend businesses from strikers. He also dispatched the Ohio militia to several locations to maintain law and order. Cleveland residents opposed to the strike responded to the governor's call and formed their own police force to protect Baltimore & Ohio Railroad property. In Columbus, mobs attacked and destroyed much railroad property. Protests in Zanesville, Lancaster, and Steubenville also briefly shut down rail service. The worst agitation occurred in Newark, a major depot for the Baltimore & Ohio Railroad. On July 18, 1877, strikers blockaded the railroad, refusing to let any trains to pass. Governor Young quickly dispatched militia forces to the city, hoping to avoid violence. By the end of August 1877, the strike had ended primarily due to federal government intervention, the use of state militias, and the employment of strikebreakers by the Baltimore & Ohio Railroad Company. The Great Railroad Strike was typical of most strikes during this era. The availability of laborers and government support for businesses limited workers' ability to gain concessions from their employers. Dubofsky, Melvyn, and Foster Rhea Dulles. Labor in America: A History. N.p. : Harlan Davidson, 2004. Montgomery, David. Fall of the House of Labor: The Workplace, the State, and American Labor Activism, 1865-1925. 1989. N.p. : Cambridge University Press. Stowell, David O. Streets, Railroads, and the Great Strike of 1877. Chicago, IL: University of Chicago Press, 1999.